This summer, for the first time in a decade, England will be heading to a major tournament without their record goalscorer Kelly Smith. But the Arsenal forward has no regrets about her decision to retire from international football earlier this year. And as one of six nominees for the Women's PFA Players' Player of the Year award, Smith is proving that, at the age of 36, she can still mix it with the cream of the crop. "I'm glad now, looking back, that I've retired (from internationals) because my main focus is on Arsenal," Smith told BBC Sport. "I've really got to take care of my body. When I had injuries before, I felt an added pressure to make the fitness tests. "With the travelling, and the added pressure of fitness tests, it was hard mentally to deal with that. You worry you're not going to make the squad." Smith, who scored four goals for England at the 2007 World Cup finals, was awarded an MBE for services to football in 2008. Kelly Smith won 117 senior caps and scored 46 goals in an England career that lasted almost 20 years. She made her debut in 1995 and played in two World Cups and four European Championships. England, now coached by Mark Sampson, face Mexico and Colombia in their World Cup group after opening their campaign in Canada against France on 9 June. "It's going to be tough for England but I think Mark Sampson is going to pick the right group of players," Smith added. "I think you'll see a lot of squad rotation. "He likes to use everybody, rather than how the previous manager just had a certain 11 or 12 players. It's about keeping those players happy and everyone knowing that it's a squad effort. "Mark has done that since he's been in charge. He has given everyone an opportunity. He's said the door is open for everybody. Play well for your club and you'll get a chance for England. "I wish them all the best and will be following them." "This season, it is as competitive as ever," said Smith. "You just don't know who is going to win on a given day. Any team can beat anybody, which is what you want. "You want the league to be competitive so you get a good, solid fan base. "The league in America, when I played there the first time, it was a very technical league. Not so much nowadays - I think it's more strength and power there. "Our game is really pushing on and you can tell that by the media exposure that it's getting, and the type of players that want to come and play here from Spain, Sweden and South Korea. "It really seems like the up-and-coming league at the moment. It's top quality." Smith has been nominated alongside Eniola Aluko, Ji So-yun (both Chelsea), Lucy Bronze (Manchester City), Jess Clarke (Notts County) and Karen Carney (Birmingham City). "I was a little bit surprised, coming off the back of last season," said Smith. "We made two cup finals and won the FA Cup but finished fourth in the league. "But it's nice that other players still appreciate and recognise what you do on the pitch and vote for you, so I'm pleased. "We had a really tough start to the year, losing so many players and taking time to gel. We were at the lower end of the table and it was frustrating, but we all stuck together and still pulled it through with good performances in the second half of the season. "I'm still enjoying it and looking for more trophies this season. I'm just looking to perform to the best of my abilities." Arsenal are currently second in Women's Super League One with seven points from their first three league games of 2015. 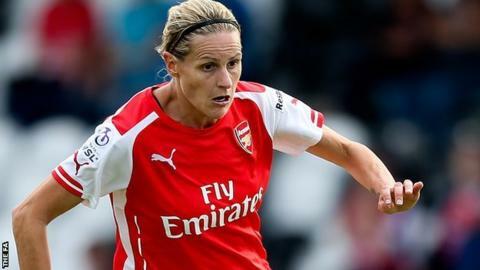 Alongside Smith and other veteran stars including goalkeeper Emma Byrne, 35, winger Rachel Yankey, 35, and former England captain Casey Stoney, 32, Arsenal's current first-team squad has an abundance of exciting young players. "The manager (Pedro Martinez Losa) is developing the youth and giving them a chance," Smith added. "The youngsters are training really well and he's proved his word by playing them. He's not afraid to put them in." Gunners team-mate Leah Williamson, who kept her nerve in unique circumstances to score the penalty that sent England into the European Under-19 Championship finals, is included in a five-person shortlist for the Young PFA Player award. Smith continued: "Since she stepped up to the first team, you wouldn't believe that she is 18 years old, with her composure, vision and understanding of the game. "It feels like she's more of an senior player. She is still learning the game but, when you play with her, she plays way beyond her years. "She's been at Arsenal since she was a kid, she's a lovely girl. I'm happy that she is with Arsenal because she'd be a gem for any other club. "Carla Humphreys is another England Under-19 player who has got a lot of game time in pre-season and at the start of the season. "Caroline Weir is also 19 and a Scotland international, and some of the other Under-17s have been training with us, so it's good for them to see what the level of competition is like in training, for them to push on and try and make the squad."